Gangneung [formerly dead link] (강릉,江陵) is the largest coastal city in Gangwon Province, third largest overall. Gangneung is nestled at the east side of South Korea's longest mountain range, Taebaek. The Taebaek Mountains stretch along the eastern edge of Korean Peninsula and run along the East Sea. Geologically isolated from most parts of the country, the city was able to preserve its own distinct culture, and to date it has a tendency of being politically and culturally more conservative. Gangneung was the venue of the ice sports in the Olympic Winter Games PyeongChang 2018. Korea Travel Hotline & Complaint Center, ☎ +82-2-1330, toll-free: 1330. 00:00~23:59. Support Korean, English, Chinese, Japanese for announcing tour information, complaints and emergency calls. Free of Charge. Gangneung Station Tourist Information Center, 17, Yongji-ro, Gangneung-si (in the train station), ☎ +82-33-640-4534. 09:00-18:00. Provides maps and guide books (English, Japanese, Chinese). Terminal Tourist Information Center, Gangneung-si Hongje-dong 992-3 (beside the bus terminal), ☎ +82 33-640-4537. 09:00-20:00. Provides maps and guide books (English, Japanese, Chinese). KTX is the high-speed train which was opened on December 21, 2017. The train runs at a maximum speed of 250 km/h and it takes two hours from Seoul station to Gangneung and an hour and half from Cheongnyangni station to Gangneung. The fare is ₩27,600 from the Seoul station and 26,000 KRW from the Cheongnyangni station. Tickets can be purchased a month in advance, from 07:00 to 20 minutes before the departure of the train, at the station or through KorailTalk (Mobile Application) or via the official website(http://www.letskorail.com). Gangneung Station is the terminus for the Dong Hae line of Korail. There is a train that connects to Cheongnyangri Station in Seoul, but it goes takes a circuitous route through the mountains and takes 6 hours. A tourist information booth is in front of the station. Gangneung Bus Terminal connects Gangneung to all major cities in Korea. Gangneung is a popular weekend destination during the summer for Koreans living in the capital area. There is only one expressway that connects Gangneung to Seoul. Consequently, traffic gets very heavy coming in on Fridays and leaving on Sundays. Here you can find the main tourist information centre (TIC). Also the international airport of Incheon can be acceded by an "Airport Limousine" from this bus terminal. That bus will take four hours, stoping by the small Gimpo Airport on the way. Cost ₩30,000. Downtown Gangneung is not very big. One can cross downtown on foot in 15 minutes. Getting to other popular areas will take less than 15 minutes by taxi from downtown. Most streets in Gangneung have names and signs. The public bus system is good. Most signs on the buses have English. Fare is a flat ₩1,300 for city routes when you pay cash. Transportation card holders will receive a 10% discount from the regular fares. Transportation card holders can transfer between buses and a regular bus and an express city bus once for free. If you wish to transfer to a different bus, make sure to tag your transportation card at the transportation card terminal located near the front door or the rear door. You must transfer to a different bus within 40 minutes to avoid being charged an additional fare. There are two different types of transportation cards: prepaid and post-paid. Prepaid transportation cards can be purchased at a designated card sales (charging) shops with a payment in cash, while postpaid transportation cards refer to credit or debit cards issued by credit card companies or banks that have a transportation card function. Taxis in Gangneung are considered an affordable and convenient means of transportation. You can catch a taxi anywhere in Gangneung on the streets. All of the taxis charge the fare based on a metering system, with additional charges imposed upon the base fare of ₩2,800 according to the distance of travel. Taxi drivers will accept payment in cash or by credit card. Museum of Oriental Embroidery, 140-12, Jukheon-gil, ☎ +82 33-640-0600, The Museum of Oriental Embroidery is a place of culture and the arts, where visitors can enter and experience the world of Eastern embroidery, centering on traditional embroidery works of Korea, China and Japan. With its high-quality collection, the museum allows people to develop their emotional sensibility, refine their knowledge in the arts, and receive creative education. It was established with the aim of promoting the mutual exchange and cooperation between creative artists and domestic and overseas institutions specializing in culture and the arts as a means to contribute to the cultural advancement of mankind. 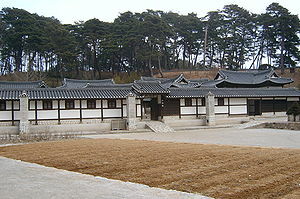 Seongyojang House, 63, Unjeong-gil, ☎ +82 33-648-5303, A traditional house of the high Joseon Dynasty society. It is famous for the beautiful curved lines of its roof, which resemble the shape of traditional Korean socks and hanbok clothing. Garments and products from the Joseon period are displayed in the exhibit and folk information exhibit within Seongyojang. Gyeongpo Wetland, 670, Unjeong-dong, This area was established to restore the lake ecosystem near Gyeongpo and create a habitable environment for a wide range of aquatic organisms. The salinity of the Gyeongpoho Lake was lowered and the water was allowed to flow out, instead of remaining stagnant. There is an open public square as well as facilities where people can observe the wetland ecosystem. Gyeongpodae Pavilion & Gyeongpoho Lake, 365, Gyeongpo-ro, Gyeongpodae Pavilion is arguably the best of the 8 scenic spots of Gwandong, and it is a place where you can see the moon in five spots: the sky, the sea, the lake, a liquor glass and eyes of your beloved. The Gyeongpoho Lake is 4.3km in circumference, and it contains Hongjangam Rock, which is associated with a heart-wrenching love story. Charmsori Gramophone & Edison Science Museum, 393, Gyeongpo-ro, ☎ +82 33-655-1130, As the world's largest museum of gramophones, the Gramophone Museum displays unique gramophones collected from all over the world. The museum has items from a tin foil that was invented by Edison in 1877, all the way up to modern audio systems. Gyeongpo Beach, San 1, Anhyeon-dong, Gyeongpo Beach has a long stretch of a sandy beach alongside the sea. Here, you can find Gyeongpodae Pavilion, which is the most famous of the 8 scenic spots of Gwandong, and the beach feels extra cozy as it is surrounded by pine trees, which are reminiscent of an exquisite folding screen. It is considered one of the best beaches on the east coast because of the relatively shallow water, white sandy beach, and perfect water temperature. Heo Gyun and Heo Nanseolheon Memorial Park, 1-29, Nanselheon-ro 193beon-gil, ☎ +82 33-640-4798, This is a memorial park that contains the former home of Heo Nanseolheon (1563-1589), a poet of the Joseon Dynasty, and Heo Gyun, the author behind Hong Gildong jeon (The Story of Hong Gildong), as well as a memorial hall dedicated to them. The house has been designated as Cultural Material No. 59, while the memorial hall has been established as a cultural site to honor the literary achievements of Heo Gyun and Heo Nanseolheon. Gangneung Unification Park, 1715-38, Yulgok-ro, ☎ +82 33-640-4470 (Warship Pavilion), 4469(Exhibition Hall). Opened with the purpose of evoking a sense of national security, divided into two parts: Security Exhibition Hall and Warship Pavilion. The North Korean submarine that carried armed spies in the 1996 invasion is displayed here at Warship Pavilion. Haslla Art World, 1441, Yulgok-ro, Gangdong-myeon, ☎ +82 33-644-9411, This is a [[acre|26.9}} natural art park, established by a husband-and-wife team of sculptors and displaying pieces of grass, flowers, trees, and rocks harmonized artistically . Named after Haslla, an old name of Gangneung, it features beautiful scenic points for the sunrise and moonrise along the coast. Sandglass Park, Jeongdongjin-ri, Gangdong-myeon, ☎ +82 33-640-4536, Sandglass Park contains the world’s largest sandglass. The sand in the top part and the flowing sand symbolize the future and the present, respectively, while the golden shape represents the sun that rises over the East Sea, and the parallel rail tracks signifies the infiniteness of time. Jeongdongsimgok Badabuchaegil (Sea Road), Port of Simgok in Gangdong-myeon, ☎ +82 33-641-9444(Jeongdong Ticketing Office), 9445(Simgok Ticketing Office), This is the one and only coastal terrace in Korea, where you can observe the traces of the crustal movements that occurred 23 million years ago and gave birth to the East Sea. It has been designated as Natural Monument No. 437. Heonhwa Road, Heonhwa-ro, Gangdong-myeon, ☎ +82 33-640-4414, Heonhwa Road is a charming road that is associated with a number of legendary tales including the story of Gangneungtaesu Sunjeonggong and his wife Suro in the Silla period and the god of water who engulfed her because he was captivated by her beauty, and the story of an elderly man who picked royal azaleas from a cliff to be offered to the god of water for her to return. These tales are described in Samguk Yusa (Memorabilia of the Three Kingdoms) under the titles Haega and Heonhwaga. Old Daegwallyeong Road, Eoheul-ri, Seongsan-myeon, ☎ +82 33-640-8520, Daegwallyeong is situated at the center of the Baekdudaegan Mountain Range, which is considered the spine of the Korean peninsula, and it has long been an important gateway, bridging Gangneung with Pyeongchang, Wonju and Seoul. The sights of classical scholars including Yulgok Yi Yi walking over the hills with a traveler’s knapsack on their backs and itinerant vendors passing through with bags of goods can no longer be seen today along the Old Daegwallyeong Road; however, the pristine natural environment still remains to captivate the hikers with its beauty. Daegwallyeong Recreational Forest, 133, Sampoam-gil, Seongsan-myeon, ☎ +82 33-641-9990, This is Korea’s first natural recreational forest established in 1988 on the foothills of Daegwallyeong, where there are a dense pine forest, clean water in the valley, and fascinating rock forms. A part of the Areumdeuri Pine Forest, containing 50- to 200-year-old pine trees, was created by artificially planting pine seeds between 1922 and 1926, and this is why it is considered to have high academic value. Also, in addition to a self-learning forest experience program, there are many sightseeing spots including the Wild Flower Garden, and a number of forest culture experience areas. Coffee Cupper Coffee Museum, 806-5, Wangsan-ri, Wangsan-myeon, ☎ +82 33-655-6644, The museum houses a wide range of rare coffee-related items from around the world including coffee roasters and grinders and espresso machines. You can also tour the Coffee Cupper Coffee Farm, which is where commercial coffee was produced for the first time in Korea, and take a look at the history of coffee with your own eyes. The museum also offers various experience programs related to coffee. Anbandegi Village, 428, Anbandeok-gil, Wangsan-myeon, ☎ +82 33-655-5119, Situated in a high-altitude area at 1,100m above sea level, Anbandegi Village was formed as slash-and-burn farmers settled here after developing farmlands and started growing hardy plants. Since 1995, it has been the top vegetable producer in an alpine area in Korea. It presents an exquisite landscape, with a beautiful blend of green plains and wind turbines at the summit. Nochusan Mojeongtap Trail, 1687-1, Daegi-ri, Wangsan-myeon, ☎ +82 33-647-2540, Cha Ok-sun relocated to Gangneung from Seoul after marrying a local man, and had four children. When two of her children died before her as a result of an unfortunate accident, she, of course, fell into despair. One day, a mountain god appeared before her in one of the dreams, and told her to build a tower with 3,000 stones to bring peace to her family. Cha Ok-sun finally accomplished this in 2011, and now people believe that when you earnestly make a wish here, it will come true. Jumunjin Seafood Market, 312-260, Jumun-ri, Jumunjin-eup, ☎ +82 33-661-7302, You can enjoy fresh raw fish that was just caught from the sea near the Port of Jumunjin. There are many things to see, eat and enjoy, in addition to the Jumunjin Marine Museum as well as the nearby dried fish shops and Jumunjin Hoe (Raw Fish) Center. Sogeumgang Sheep Ranch, 1321, Jingogae-ro, Yeongok-myeon, ☎ +82 33-661-3395, is a ranch that runs experience programs in Sogeumgang Jangcheon Village in Yeongok-myeon, which is famous for its generous residents as well as the beautiful mountains and river. There are diverse experience programs where the participants can interact with the sheep, play folk games, make traditional food and more, and this is why it is very popular as a natural experiential learning center for children. Sogeumgang River, 500, Sogeumgang-gil, Yeongok-myeon, ☎ +82 33-661-4161, This area has been referred to as the small Geumgangsan and Cheonghaksan because of its exquisite scenery created by the clear waterfalls and fascinating rock forms, and its splendid beauty is attested by its designation as Scenic Site No. 1 (1970). The hiking trails near the Sogeumgang River are not on rugged terrains, so you will be able to enjoy a light trekking experience. Gangneung Daedohobu Government Office, 6, Imyeong-ro 131beon-gil, ☎ +82 33-640-5119, Jeondaecheong Hall, where the jeonpae and gwolpae tablets of the kings were enshrined and ritual ceremonies were performed, and Imyeonggwan Halls, a guest reception area comprised of two buildings on the left and right side of Jeondaecheong, were built in the 19th year of King Taejo’s reign over Goryeo. The building complex was repaired and restored multiple times, and used as an Ordinary High School by the Japanese before being demolished in 1908. Wolhwa Street, 21 Geumseong-ro, There was a railroad above this road. Wolhwa street park and food market are loved by many people. Solhyang Arboretum, San 135 Gujeong-myeon, ☎ +82 33-660-2320, is considered a primeval forest, with well-cultivated Geumgang pine trees (Pinus densiflora Erecta), an indigenous tree species of Gangneung. The arboretum, covering around 78.5ha in area, is divided into 23 different themes, with around 240,000 plants classified into 1,330 species. Gangneung Coffee Street, 17, Changhae-ro, The Coffee Street along Anmok Beach was created naturally with famous baristas settling down here. The once tranquil beach has been transformed into a famous tourist spot, with the recent boom of coffee. Biking. Gyeongpo Lake has a paved biking/walking trail around its 4 km long shore. There are bike rental shops near the lake. Aranabi Experience, 1982-1, Haean-ro, ☎ +82 33-641-9002, “Aranabi,” meaning “flying like a butterfly above the beautiful sea,” is a befitting name for this enthralling experience program where you can travel a 600m distance across the Namdaecheon Stream between Namhangjin and Anmok Port in just 2 to 3 minutes in mid-air. You can also cross the area by walking along the Sobaram (Pine Wind) Bridge. Surfing, Geumjin Beach, When you take a look at the blue sea of Gangneung and the moderately high waves, you will automatically think of surfing. People in their 20s and 30s are now visiting Geumjin Beach for a surfing experience. There are clubs and numerous travel agencies that rent out surfboards and provide surfing lessons for beginners, so there is no need to worry even if you are new to surfing. Scuba diving, Sageunjin Beach, There is a perfect place to enjoy scuba diving in Korea. It’s none other than the Sageunjin Beach of Gangneung, which is rising in fame as the Mecca of Scuba Diving in Korea. With assistance from a team of professional instructors, even first-timers and beginners can have a fun scuba diving experience in the clean sea surrounded by beautiful landscapes. Kiteboarding, Songjeong Beach, Kiteboarding, which will make you as though you are running across the blue sky as you glide over the blue sea, has become a popular marine recreational sporting activity. This is why you can see kiteboarding enthusiasts and club members coming here with their own kiteboarding equipment. Songjeong has hosted the Gangneung Kiteboarding Association Korea Cup six times already, which attests to its status as the ideal place for kiteboarding. Gangneung Danoje. 3rd to the 7th day of the 5th month of the lunar calendar every year, mid June. Gangwon-do's largest folk festival was registered in 2000 with UNESCO Intangible Cultural Assets. The city becomes a festive ambience with over 50 official events. The greatest attractions are the Gwanno Mask Play, open-air market with a thousand shops and splendid fireworks. International Junior Art Festival (IJAF) (annually at Gyeongpo Beach). An youth festival which lasts four days (1-4 August). With 300 participants from seven nations and 500 visitors every night, it is considered the biggest international youth festival in South Korea. Each group performs twice: one performance on the main stage at Gyeongpo Beach, one performance on the sub stage next to the Gangneung Arts Hall in the city. The first evening starts with a big parade of all participants through the city towards the beach. The opening and closing ceremony includes a big fireworks at the beach. During festival days, the participating groups attend several cultural workshops. The festival is free of charge for the participating groups, entrance is free for the audience. Gangneung Coffee Festival. is an eleven-day long annual event which began in October of 2009. Gangneung has recently been called 'Coffee City' due to the emergence of privately owned coffee shops that serve high quality coffee. Gyeongpo Cherry blossoms Festival held in the mid-April every year, at the whole areas of Gyeongpodae Pavilion, has become the representative festival of the city. The beautiful flowers bloom along the 4.3-km road of Gyeongpoho Lake, with Gyeongpodae Pavilion in the center. Spring flowers such as cherry blossoms, forsythia and narcissus bloom beautifully, with the old trees spreading their branches and blooming flowers. There are various events including Flower Exhibition and Cultural and Artistic Events around the Gyeonpodae Pavilian. There are several market places in Gangneung. Gangneung Jung Ang Market, at the center of the city, is the largest one in the area. Jumunjin Fish Market, at the eponymous harbor, is also very popular with tourists as they can see and buy various types of fish, squid and shellfish. There are two major supermarkets, Homeplus and E-Mart. Uncle Bob (coffee shop), Nansolhyun ro 81-5, or Ponam dong 964, ☎ +82 5327-2008, e-mail: unclebobkr@gmail.com. 10:00-22:00. American-owned/operated coffee shop. Specialty coffees, teas, fruit drinks, take out and lite brunch with natural countryside outdoor seating. On bicycle trail 5 minutes from the lake or beach, 10 minutes from the bus terminal, 10 minutes from downtown. ₩3,000 for Americano. Chodang Grandma's Sundubu, 77 Chodang Sundubu-gil, ☎ +82 33 652-2058. If you like sundubu (soft tofu), there is no better place to go in town and Gangneung is well known for some of the best sundubu. Sundubu: ₩4,000. Gangneung Gamja Ongsimi, 171 Toseong-ro, ☎ +82 33 648-0340. Televised on several popular national TV programs for their gamja ongsimi, a variety of dumpling soup. Yehyang Makguksu, 62 Nanseolheon-ro, ☎ +82 33 644-2270. Makguksu is Gangwon's local specialty buckwheat noodle dish served in a chilled broth. If you ask the locals, Yehyang is the place they will tell you to go for makguksu. ₩6,000 for a bowl. Geumhak Kalguksu, 12-6 Daehak-gil, ☎ +82 33 646-0175. Not a very clean place, but their kalguksu, a handmade, knife-cut noodle soup is what makes the locals keep coming back for more. ₩4,000 for kalguksu..
Ho Ho Sarang, Byeong Sang Dong 327, ☎ +82 33 651-2151. This family-owned restaurant serves a truly unique dish: baked yellow squash stuffed with smoked duck. You can also enjoy dong-dong ju, a traditional rice wine, with your meal. The area code for Gangneung and the rest of Gangwon province is 033. Pyeongchang, the site of the 2018 Winter Olympics, is approximately 30 km west of Gangneung. There are several ski resorts such as Alpensia Ski Resort, where the opening and closing ceremonies of the 2018 Winter Olympics took place, and Yongpyong Ski Resort [dead link] which has 31 slopes and 15 different lift facilities. This city travel guide to Gangneung is a usable article. It has information on how to get there and on restaurants and hotels. An adventurous person could use this article, but please feel free to improve it by editing the page. This travel guide page was last edited at 20:39, on 11 January 2019 by Wikivoyage user Traveler100bot. Based on work by Wikivoyage users Wrh2Bot, Ground Zero, Ibaman, AndreeBot, Twotwo2019, Motoko C. K. and Traveler100, Wikivoyage anonymous users 211.253.82.243 and 1.248.172.177 and others.